_____My history with the Tron arcade game is a long one. I cannot remember when I first played it. All I remember is always wanting to. 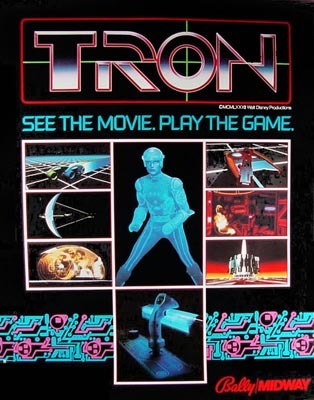 I grew up in Southern California and whenever I went to Disneyland with friends or family, my first stop was the arcade in Tomorrowland to play Tron. When I was living in Costa Mesa, I regularly visited a great punk record store called Noise Noise Noise. They had a Tron game and the store made more money off my Tron playing than my music purchases. If you've looked at my record collection you know what kind of money I must have dropped in their game. Then came the lean years in Atlanta where nobody in town had a game I could play. And so... I started looking on eBay and eventually bought one that was in fairly good condition. _____Shortly thereafter, I came in contact with a guy in Tennessee that restored vintage arcade games and I brought it up to him for some work. He did a great job. The body was sanded, refinished and new decals were put on. I replaced the glass, all the light bulbs and speakers plus a free game button was installed. The power supply was replaced and the monitor capped and tuned. All in all, it's almost a completely new game and it looks like a million dollars. Few things are sweeter than playing Tron whenever you want to. Much respect to Scott "Jerry" Lawrence for some of the information and images used here. Too much red, yellow and blue?